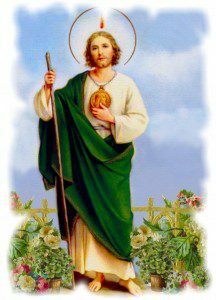 St. Jude, also known as St. Jude Thaddeus, is known and loved throughout the world as the Patron Saint of Hopeless Causes. He was one of the twelve Apostles and a cousin of Jesus Christ. He courageously preached the Gospel, often in the most difficult circumstances. St. Jude is often shown carrying an image of Jesus. Tradition tells us that this recalls a miracle when a king, afflicted with leprosy, was cured of this horrible disease after St. Jude gave him a cloth that had been pressed to the face of Christ. In the Americas, it was the Dominican Friars who helped spread devotion to St. Jude, particularly in the United States. In 1903, Father Thomas Lorente, O.P., and members of the Spanish Dominican Province came to New Orleans and were asked to take care of the oldest church building in New Orleans, the Mortuary Chapel, now called Our Lady of Guadalupe Church. By 1935, Our Lady of Guadalupe Chapel began a public novena to St. Jude. Today, St. Jude continues to be one of the most popular and beloved Saints, a trusted heavenly intercessor for all those seeking God’s assistance during times of family crisis, sickness, and trouble, especially when all hope seems lost.